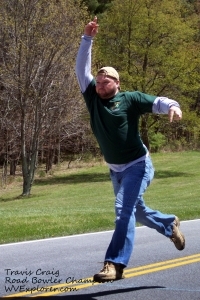 Home Recreation Irish Road Bowling Irish Bowling tourney brings record high-rated players to W.Va.
Irish Bowling tourney brings record high-rated players to W.Va.
Travis Craig at Road-Bowling Championship. Photo courtesy David Powell. The W.Va. Irish Road Bowling Association will host the ancient sport’s regional championship August 3-5 at Blackwater Falls State Park, attracting more highly rated players than have ever before been assembled in the U.S. Clubs from Boston, New York City, and West Virginia compete each year, after which the winning team advances to the All-Ireland Finals, hosted this year in Boston, October 6-7, according the association spokesman David Powell. Irish road bowling, or long bullets, has been played in rural Ireland for more than 300 years. An iron and steel cannonball the size of a baseball is hurled down a one-to-1.5 mile road, and the bowler who throws the least from the start to finish lines wins the match. Boston will be led by 19-year-old Sean O’Mahoney, the 2017 All-Ireland Novice-1 Champion, with his father, five-time All-Ireland Champion Florrie O’Mahoney, his coach, and by Brendan O’Donovan, 2017 Junior-C All-Ireland Champion. Also representing Boston are two-time All-Ireland champion Brendan Fleming, Roger O’Riordan Junior-C All-Ireland finalist, North American Region finalist Kevin McGrath, and Gerald “Bogie” Leahy, North American Region Champion, and his coach, two-time All-Ireland Champion Con O’Callaghan. From New York, four-time All-Ireland Champion Adrian Lappin and three-time All-Ireland Champion Fergal Carr are the highest-rated players in the U.S., Powell said. Also, All-Ireland Finalist and New York President Mick “Jet” Maloney will be joined by veteran bowlers Kevin O’Keefe and Brian O’Keefe and North American Region Champion Padjo O’Sullivan. The West Virginians will be led by Travis Craig and Stephen Wallington, both North American Region Champions and All-Ireland Semi-Finalists and veteran bowler Ken McClintic. Special guest Stefan Albarus, from Hamburg, Germany, will be throwing. The world champion in 1992 in German lofting, a similar outdoor-bowling sport, Albarus is in the Guinness Book of World Records for a 106.2 meter loft set in 1996. In 2000, he set a world record in the European Championships for three lofts totaling 309.9 meters. Friday events will include practice matches and a reception at the lodge; Saturday will feature the semi-finals; Sunday will include finals and the awards ceremony. All events are open to the public.